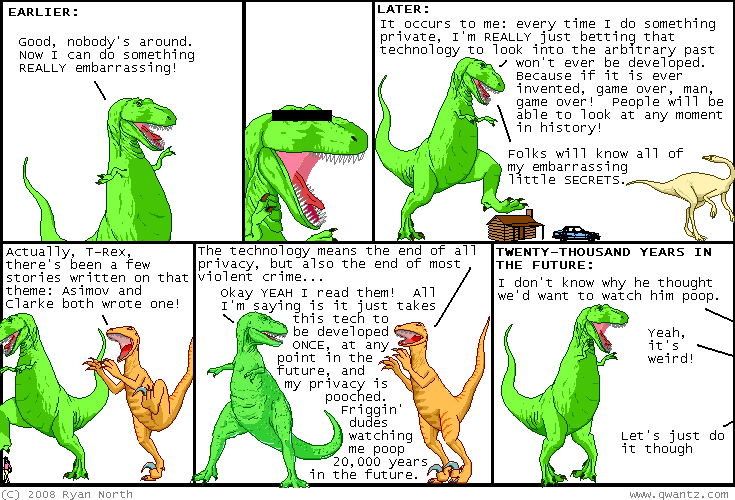 Dinosaur Comics - February 21st, 2008 - awesome fun times! –You're asking, "How much of someone's personality is determined by their body?" February 21st, 2008: The dinosaur I linked to the other day isn't actually a "dinosaur", it is a "pterosaur" which is not a dinosaur! But I am defending myself by saying that it's SO CUTE that it could be a dinosaur. Yes. So hey, remember when someone on eBay ripped off my shirt? Hot Topic (never the most respectable company at the best of times) is now stealing Jess Fink's design she made for Threadless. Here's her design and here's Hot Topic's rip of it. The eBay thing ended well for me: I emailed the guy and he took it down and I considered the matter closed. Jess emailed Hot Topic and they wrote back with what's really a "ha ha what do you mean they're the same that's CRAZY" response, and you can imagine them tugging at their collar uncomfortably while they say it. Anyway! The best thing to do in these situations is draw attention to it, because then things seem to get fixed. So clean up your act, Hot Topic! One year ago today: t-rex apparently believes all westerns are john ford westerns, but that's okay. i could live with that.